Sophie Delila is a Universal recording artist with three albums to her name. 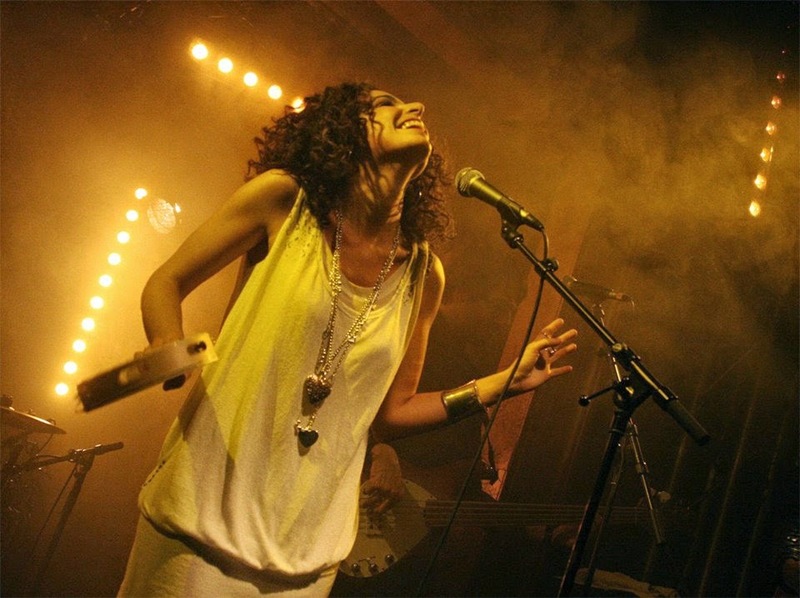 She has supported acts such as Lionel Richie and Jamiroquai, collaborated with artists such as Jeff Beck and Plan B, and written songs for Westlife. Sophie's second album 'Hooked' was mostly co-written with Steve Booker, known for his success with Natalie Imbruglia, Duffy and The Sugababes. Sophie's most recent album 'My Life could Use a Remix' was released in 2014. Here she shares her songwriting tips. Do you have a daily songwriting routine or do you wait for inspiration to strike? I think you have to be ready for inspiration to strike, when it strikes. When it doesn't, you've got to look for it! I just write stuff down all the time and record melodies on my phone… And sometimes I take them to the studio with me. Do you have any tricks to get the creative juices flowing? Listening to records and watching gigs are two things that inspire me, as in 'motivate me' to write songs. Playing guitar or piano gets me started…. Almost every time. Sometimes I hear something, chords, words, sounds that touch me, and something ticks in my head… :) Can't really explain that one. Do you find you normally start with a melody or lyrics? I find it easier to start with a title and a few lines. Mostly because I try to avoid coming up with a great melody, a great vocal take with the perfect vibe, and no lyric! I usually try to hold off singing until i've got all lyrics. But there are days when I start from scratch and it all comes at the same time. That's the best way! Do you think that melody is the most important aspect of a song? I think everything is important, it depends on the song. I heard that some people who listen to music these days don't even 'hear' melodies that much. It sounds crazy but i've heard that a few times… In that case all they've got left is lyric and the character of the voice, so it better be good. :) Melody is really important to me, and I do equally appreciate smart, touching, real, authentic, original and poetic lyrics to go with it. How long does it take you to write a song? From 20 minutes to a few years. Could you explain a little about the writing process behind a few of your songs? 'What Did I Do' was written about a friend who I'd been close to for a little bit, before moving to another country. We kept in touch and gradually spoke less, but I would occasionally pop up online and send messages to say hi. Most of the time with sparse answers, until one day, when my friend wrote me a long message explaining he didn't want to be friends. It triggered feelings, it hurt me, I wrote a reply that I never sent. The same day I had a session with a Swedish writer, Carl Bjorsell, we talked about it… He picked up the guitar, played a few chords and I started singing the melody and lyrics from scratch, all at once, as if it was a 'condensed' version of my 4 page reply. 'Bound To Fall' is about a friend who passed away a few years ago in a mountain accident, while on an 'extreme' skiing trip. A few days later, I had a session with NY songwriter Julian Velard, and again … we talked about it… He started playing the piano riff of the songs (great piano player) and I sang. We threw words at each other and ended up fitting them to the melody, more or less at the same time. 'My Life Could Use A Remix' was written with Don Black, the famous lyricist. So naturally, he wrote the lyrics and I wrote the melody/chords. We met one afternoon, we had a coffee and chatted for 2 hours. We wrote the song in the hour that followed! What songs that other people have written do you particularly admire? Many of them are by Stevie Wonder… They Won't Go When I Go… Of course I love the more commercial ones but I have a soft spot for his 'darker' and more confidential numbers. I also love current/more recent songs with a great sentiment, like Diamonds which Sia has written (which i recorded a cover of). Bridge Over Troubled Water… Raspberry Beret… I mean… There's a LOT of songs. Too many I admire to list them all here really! Do you think that a technical knowledge of theory is important or does it get in the way? It's important to know when to use it and when to forget about it. Using theory can allow you to be more versatile. It's also great if you're writing with other musicians. You speak the same language and can guide each other better… Also theory may allow you to be a bit more versatile in the long run. May be if you're starting out it's nice to be a little 'limited' to what you do best with intuition, in a way… Rather than thinking in terms of theory! Do you tend to revisit your songs and rewrite them? Not very often. It's hard to change parts. But when i've done it, it's worked for the best. Do you write songs with a view to being commercial and following current trends? Not necessarily. It's so much more exciting to write something fresh that you haven't heard over and over and that everyone's doing. The dream eventually is to start the trend isn't it? Have you done much co-writing, and if so what do you see as the benefits? I've done a lot of co-writing, it's one of my favourite things in the creative process. It's a bet every time you write with someone new. It's not for everyone. The pressure to absolutely get a song or at least parts of a song in one afternoon works for some and not for others. I'm for experimenting and finding good creative partners. Who do you view as great songwriters. Who has inspired you musically/ lyrically? Stevie Wonder, Carole King, Sia, Bob Dylan (even though he's not necessarily one of my influences I do admire the guy! ), Eg White, Elton John, Michael Jackson… Again… there are SO MANY. Marvin Gaye was also an amazing songwriter. Do you have any idea where you ideas come from? Not really. It's a mix of things i grew up with, things that are around me, and my own ways to do/play/sing things. Do you have any advice you'd like to share with budding songwriters out there? Just be authentic, smart, fresh and exciting, and write often. The rest will follow. Click on the following to find Sophie Delila on the web.